Rabbis in swing states say their High Holy Days sermons won’t address the election head on, but will touch on more general civic themes. When Rosh Hashana came around last year, Rabbi Aaron Gaber wanted to grapple with an issue roiling the country. So he decided to focus his sermon on racism. But several members of Brothers of Israel, a 120-family Conservative synagogue in suburban Philadelphia, weren’t pleased. “Some of the feedback from some of my congregants has caused us some consternation,” Gaber said. This year, with the presidential election looming just one month after Yom Kippur, Gaber will pick a much more pareve topic for his High Holy Days sermons: how congregants can be respectful to one another. He won’t directly address the election. Instead he will relate to some of the rhetoric around the campaign. Gaber’s congregation is in Pennsylvania’s Bucks County, a politically divided area in a swing state. In 2012, President Barack Obama won the county over Mitt Romney by just one percentage point. In skirting direct election talk on the High Holy Days, Gaber will be joining rabbis in “swing counties” across America preferring instead to touch on the vote by speaking about values or personal conduct. Spiritual leaders from Pennsylvania, Ohio, Michigan, and Florida noted that synagogues are legally prohibited from endorsing candidates. Anyway, they say, political talk should not come from the pulpit. Instead, when the rabbis address hundreds or thousands of congregants on Rosh Hashana and Yom Kippur, they will encourage them to have compassionate conversations. Or they will talk about how the winner — Republican or Democrat — can be a moral leader after Election Day. The rabbis’ plans track with survey data of sermons at churches across the country. An August survey by the Pew Research Center found that 64 percent of churchgoers heard their pastor discuss election issues from the pulpit, but only 14 percent heard their pastor endorse or speak out against a candidate. Rabbis in all four states said their synagogues had significant populations of voters from both parties. Some said political discourse had made the atmosphere at synagogue tense, while others don’t feel the pressure. Assistant Rabbi Michael Danziger of the Reform Isaac M. Wise Temple in Cincinnati said the constant stream of campaign ads doesn’t help. 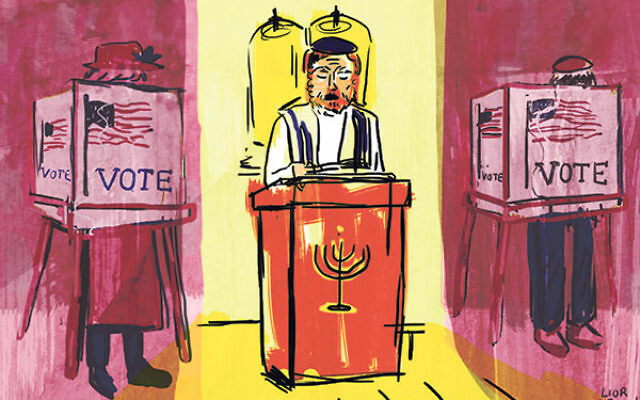 When they aren’t at the pulpit, rabbis from swing states have been politically active. Rabbi Sissy Coran of the Rockdale Temple, another Cincinnati Reform synagogue, touted a voter registration drive that the Union for Reform Judaism will be conducting in North Carolina. Birnholz teaches classes at his synagogue about biblical prophets, using current events as context. Gaber wants to work with the Philadelphia Jewish Community Relations Council to educate congregants about election issues. In December, he and Rabbi Anna Boswell-Levy of the nearby Reconstructionist Congregation Kol Emet signed a statement by the Bucks County Rabbis’ Council denouncing Republican nominee Donald Trump’s proposal to ban Muslims from entering the United States. And rabbis have also discussed politics throughout the year in smaller prayer services. Boswell-Levy feels she can address sensitive issues such as the global refugee crisis or protests in Ferguson, Missouri, at Friday night services, which draw a smaller crowd than the High Holy Days. Rabbi Steven Rubenstein of the Conservative Congregation Beth Ahm, also in suburban Detroit, agrees that politics from the pulpit serves little purpose. 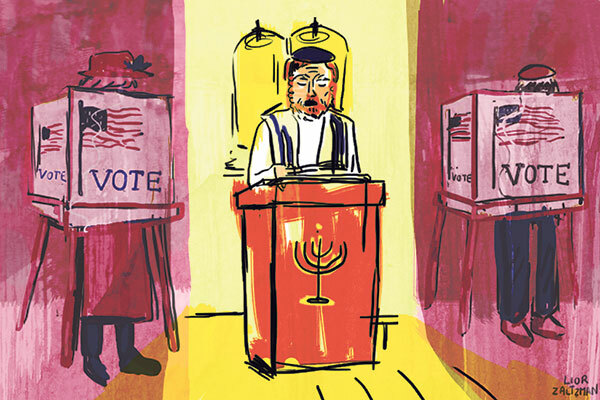 Involved congregants know their rabbis’ political leanings, no matter the sermon topic.